Comments on "On the Street.....Nolita, NYC"
Surprisingly enough,even though I wouldn't wear this, I like it a lot. Zizi shoes by Repetto? He might be a dancer. Sweet trousers. Why can't more men step out of the box like this guy?! Hhmm...i see where he wants to take this look, but i'm not sure if he is pulling it off. good effort though. I really like the buttons on the side waist of his sweater and the flat front of his pants. i think that the outfit as a whole might have looked better with a different colored sock or a even multicolored one. i think it looks a little bit too forced with the black, too earnest somehow, almost falling into that "trying too hard" category. that's the only thing that prevents me from loving it. that said, the way he has put this all together is very graceful and moody. he looks like a modern (mod) Pierrot, like the Saltimbanques that Picasso painted in his early period. This is an example of parfait/ horizontal visual layering. White, black, grey, black, back to white and topped off with a cherry beanie. You'd think he'd be more cheery dressed up like a slice of black forest cake...then again, he' dressed up like a slice of black forest cake. didn't make the cut on Project Runway. Very art school student. Love the sweater and the collars. You need to be tall and skinny to pull off pants like that. The sweater is really quite nice. The buttons on the side make it special. inspired by the Helen Levitt picture? TB would not approve! Mr. Browne's shortypants arrangement typically plays the vulnerable bare ankle against the heavy shoe. Here with the ankle safely covered and the foot in a soft, unlaced 'Marc Jacobsy' shoe, the look seems a bit unfinished and too light at the bottom, as if the gentleman has stepped out in his house slippers. I'm still not a huge fan of Mr. Browne's choices for trouser length, but I am more used to seeing it now. Kudos to this chap for doing it his own way, but there's good information here that it takes both the right proportions and accessories to pull off this look. The interest in this outfit is in the personal touches. The rolling of the pants. No laces in the shoes. The fact that the shoes are worn. A red hat for a splash of color is what makes it truly interesting. For an obviously planned outfit, it still has a natural style about it. While I like the crispness of the white shirt and the black and white sweater, this look stops me cold with the cropped gray trousers. Crops on guys just looks awkward to me... I can't get outside the box on this one. I´m not sure if this is a pic. of he or she. Any way, IMO this picture does not look very nice.It is just opposite to the one above. Reminds me of London. Very Shoreditch. I like...but the red had tips it for me...one element too much. Why so glum, chum? Concept dressing always good. Come on. If you're going to wear crazy short pants, do your white shoes have to be pointedly dirty? Reminds me of Willem Dafoe's character in Wes Andrson's "A Life Aquatic." Team Zissou! Elliot Smith meets Paul Smith. Once again sir, your eye for color and great composition outshines your subject... Very fashionable individual who seemed to be inspired by the Prada a/w 07 collection. But it's your composition of his severe graphic outfit against a glowing brick wall that seem to have a life of it's own, which makes for a fantastic knockout image. great outfit and all i am getting tired of people branding themselves as tortured fashionista. I have NO desire to dress like this, but hey, good for him! "TB would not approve! Mr. Browne's shortypants arrangement typically plays the vulnerable bare ankle against the heavy shoe. Here with the ankle safely covered and the foot in a soft, unlaced 'Marc Jacobsy' shoe, the look seems a bit unfinished and too light at the bottom, as if the gentleman has stepped out in his house slippers." It would be even better if the colour of his socks are not black. Need to clean the shoes as well...but in general I think it works and I esp.. like his sweater. i love this look, i think he pools it off perfectly, for me it's all about proportions and i think he understands them well. he might very well be a dancer! So many of these people in your photos have sad and annoyed pouty faces that I'm beginning to think that you purposely say something to upset them right before you click the camera! But his outfit definitely achieves what he is going for. These red toques are all over Vancouver. I always see them worn with a tiny leather jacket, on both guys and girls. I was getting quite sick of the look. However, taken out of that context, it's a fresh touch of color that I very much appreciate. I'm also a fan of those cropped pants paired with black socks and white shoes. Lovely! like the proportions and the details. don't care for the red hat (i hate greyscale plus red--blech--its so eighties in a bad way) or the dirty shoes. if you're going to wear brave shoes like these, at least make sure they're clean--everyone will be looking at them! I´d like to hear what Alice Olive thinks about this photo. Trust me, Brody is no dancer. Reminds me of the marginal guy on my street who wears trench with a belt from his pants, gardening gloves and a blue and red toque everyday. Maybe you should come take a picture of him. How do we know this boy is just not a loon? That's a nice wall. I could look at it for hours. Eh, so-so ensemble (the white strips on the sweater kill whatever's left of it), but my what dainty ankles and feet! No socks would make it lighter. Red turque: hm... woodpeckerish image, but it is my interpretation. A little too much ankle. Proportion a little off. Otherwise a brilliant look. from the cropped ankle up, yes! from the way too high ankle down, not so much. I like that he is able to pull off white shoes but dislike so much ankle and the black socks. the high water ankles shorten the look. The sweater could be a teeny bit longer. Reminds me a little of paul dano. Definitely influenced by a "Brown", Charly or Thom, not sure which. Great detail on the sweater. I wonder what the other sleeve looks like ? Hopefully just solid and call it good. All in all, not for me but seems just fine for him. Can picture bare ankle with chunky black/white spectator maybe. I like it from the waist up. I don't think he's pulling off these pants, unfortunately. Absolutely perfect, I think. A creative, confident display. I think his hat would work better if he was smiling. Such a joyous colour with such a sombre expression. With that face, the hat doesn't work for me. Brody is a hip cat for sure. I'm taking him surfing if he makes it to the LBC. Really nice kid..
this looks pretty good. my only comment would be it is too much thom browne all at once. a bit too literal. this would have been awesome with a double pleated gray pattern pant i thinks. Apart from the beanie, the outfit is surprisingly conservative. I think it's the pose and the glum expression that makes it seem a little odd. The short pants are not for me, but I've said that before and wont go on about it anymore. what is up with the enormous collar on his shirt? the proportions are unproportional for this kind of look. sorry, you don't pull it off. 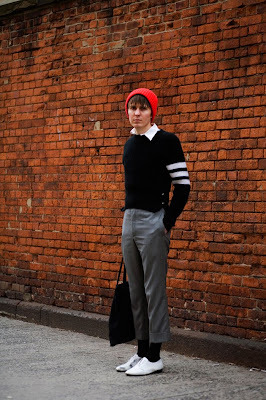 he just came out from a Thom Browne catalog, altough I like the contrast between the clasic colors with the red wool hat ! Hmm, may be I should just shut up if I cannot say anything positive. This outfit kept me thinking about it since yesterday! I think it proofs that an outfit is nothing if the person that wears it has low radiance. this look makes me feel so negative. I am sorry. the pullover, the collar, the worn out trousers, the dirty shoes... I´d like to be more tolerant, but I cant help it. Good idea, but something pulls it down. He has been inspired from DH S/S '08 and YSL S/S '08...surely! I don´t understand why my comment was not published: I said that his style reminds me of the street style looks of Helsinki (at hel-looks.com). I am sure those who were inspired by this photo would appreciate this information. hel-looks.com is soooo greaaat ! thank's for shearing it !! My immediate thought was, "That guy looks just like Elliot Smith!" I think it's a quaint look that is definitely not for everyone. My favourite bit is the two little buttons on the side of the sweater. Maybe you could hang small items from them? i dont immediatley like this, but then i love it. always a good sign. I like the hat, the sweater, the shoes (even, or maybe especially, dirty), and the pants. But something about the proportions of it all together look strangely feminine to me. Wow! Elliot Smith has been brought back from the dead - by Thom Browne! isn't this the sweetest? i love it. i love the sweater. the mood overall is lowly though? passive aggressive somehow. Love the contrast of the bright red cap and the black sweater, especially with the vaguely sporty/preppy armband stripes. However, the trouser length does NOT work for me. It's not a capri, it's not a full pant, what is it?